Title says it all. Looking forward to seeing new ones on the battlefield. looks like I have a 15% cupon on it so it is even cheaper than some tier 8 medium tanks. I will still not buy it because WG do not deserve any more money for broken things. I actually can. It is not that kind of cupon but a cupon for any kind of premium shop offer. It does not have any restriction. I was also really sursprised too. Edited by MeNoobTank, 29 March 2019 - 10:07 AM. when geytank will be sold? ant info? Because it's the standard package of a special offer you dutch! Oh nice! havent heard of any of those, so gratz to you! I will try to resist and do not use it anyway ! lol ! I was actually making fun of WG pathetic practice, you get to buy the mighty defender for a limited period (10 days!). You can't be asking to use the coupon for a discount. That'd be too much, no? Remember to choose the Defender over the 252u, because the Defender has an accordion on the back of the turret! A few days ago we had a topic asking if anyone of the tier 8 prems are overpriced. I said the IS-6, as it's priced close to the Lowe and T34 that still are the two most pricey normal premium HT's. And then the Defender comes and is even cheaper. This tank is one of the reasons why I don't play my IS-6. Tbh it should be priced the same or lower as the 112. IS-6 is def the most overpriced item in WOT atm vs what you get, when you can pay less and get this that rolls over it. Who buys tech tree premiums without -30% coupon which you can get even by playing in training rooms? And IS-6 still has that pref mm. I will too try to resist. The problem is that if you are doing clan stuff this thing is almost mandatory. I habe to insist to be able to play tree tanks like oho or tiger 2 ... sad. And FrontLine will really really become a mess. I wouldn't buy it even if it was available for 1000 gold for 2 reasons. 1) I don't like heavies, specially T8 heavies that constantly get matched against TXs and no matter how OP they are, they nothing against TX guns. And 2) If I say Defender is OP and shouldn't be sold, then buy it when it suits me, I become a fukin hypocrite and I don't want that. I'm afraid I have no moral fibre, and added one to my EU account - it's a stupidly good credit earner, and I need a lot of silver to get my EU regular tree tank selection looking a bit less embarrassing than it is at the moment...! Ah, I got one from one of those Christmas boxes. Pref MM doesn't help it in a pure tier 8 game with HT that is the norm nowadays. As even with gold, one pixel to he side on the VK's cupola and your pen chance drops to 20%. And those cupolas on the Defender are not easy to hit even at med range. Sure gold works, but when you have 50% chance vs most targets with gold. It will only get you that far head on. The IS-6 is strong still as top tier in a +2 game. But it's the equal tier games that kills it. And my pref MM tanks get those at least 70% of the time. It's why my IS-6 is gathering dust atm. It's def not worth it, not even at 30% off. Get the T26E4 with 202 pen instead. This is officially the first time that WG said they will not sell a particular tank again but they did. For the fourth time now. You gotta believe them, really. Edited by Bora_BOOM, 29 March 2019 - 04:08 PM. It's a tank a fair few people have been requesting a lot. That is not an excuse to re-sell it on the EU cluster the damn thing is an abomination that ruins the MM for people in other tier VIII or VII heavy tanks. The Defender/Object 252U was balanced when that incompetent fool Murazor was put in charge of the balance department and like all the tanks "balanced" under him it has over buffed armour. The Defender/Object 252U has better armour than the tech tree tier IX T-10, and it's armour is only marginally weaker than the tier X IS7, and that is what makes it such a disaster for the MM. Ok the gun is worse than that on the IS3 at tier VIII which just makes it slightly irritating to play, but the armour makes it painful to play against for the majority of the tanks it meets. 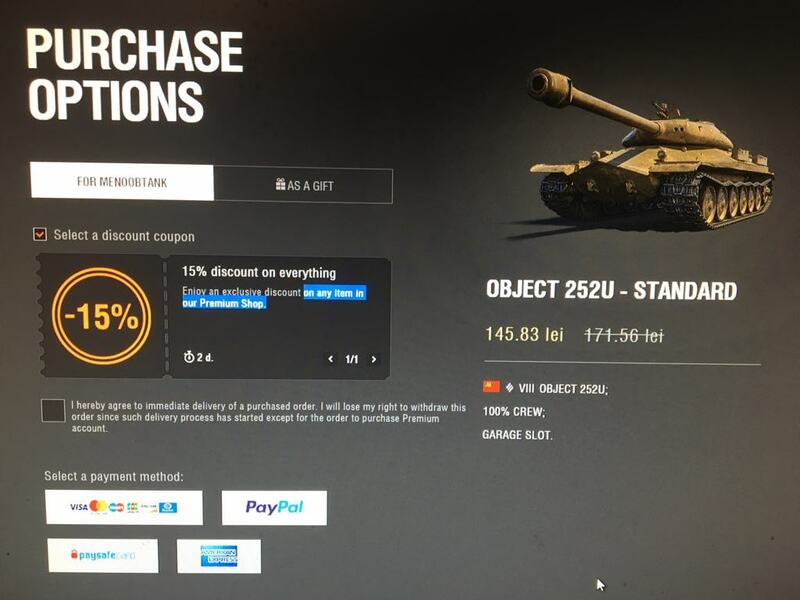 When WG said that they would reduce sales of the Defender/Object 252U they should have stuck to their word, and only put them in the Christmas gambling boxes and left it at that. Once a year sales of this abomination are quite sufficient. But I suppose loads will be bought sadly, and WG will think the profit was good, whilst at the same time losing their customers trust, and by spoiling the MM for other players alienating more of their paying customers. Not selling Defender/Object 252U's on the EU ever again would have made WG customers happier even if it might take longer to reach the profit bottom line. Selling this abomination is like drinking cheap fizzy sugar drinks, it will give you a quick burst of energy (for WG a quick burst of cash) but at the cost of rotting your teeth (for WG at the cost of rotting your relationship long term with your paying customers and their loyalty). This is a very bad idea and the marketing, long term customer retention and strategy departments should hang their heads in shame for their failure to perceive the damage the sale does to the company in the long term. Edited by arthurwellsley, 29 March 2019 - 04:21 PM.